Shoreline projects in the tidal Rappahannock river watershed require quite a bit of coordination. 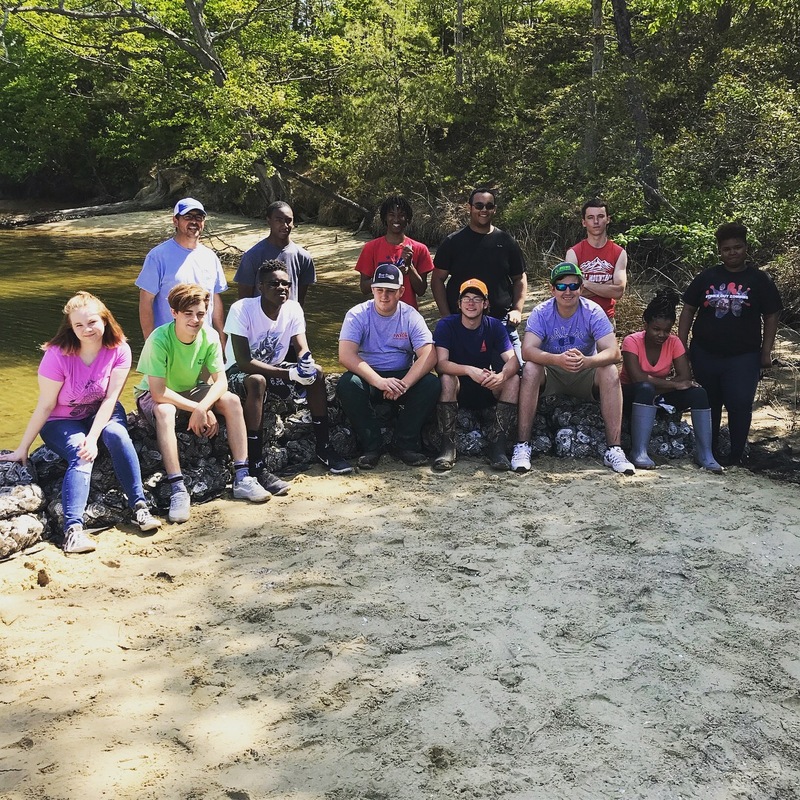 On a recent living shoreline project along Hill’s Creek in Lancaster County, Friends of the Rappahannock and the Northern Neck Technical Center needed the sun, the moon, and the stars aligned to successfully install 123 linear feet of an oyster bag sill with local high school students. This sill is a practice designed to protect the sand and wetland grasses from eroding into the river. The sun was critical for the project, for two reasons. First, we were all looking for warm enough weather to work in the water along the shoreline, especially after such a cold start to spring. Second, we needed to wait for the water to warm enough to reach spawning ranges in the tidal Rappahannock. With the weather on our side our team of awesome volunteers placed 600 bags of clean oyster shell in a sill pattern along the shoreline just before water temperatures started to reach 74 degrees, the magic temperature that causes a native spawn in the tidal Rappahannock, releasing larvae in search of clean shells to clutch (attach) to. The moon cycle was important because of tidal fluctuations along our shoreline. We needed a full outgoing tide to expose the shoreline so volunteers had access to the exact area where the designs called for placing the oyster bags in a reef pattern. On the eve of our project a full moon and a gentle wind from the NW held the water out of the river and off from our shoreline for the duration of the installation. Having aligned the sun and moon, we needed some coordination from the stars. In this case, the stars were the student volunteers from the Northern Neck Technical Center (NNTC). And they were ROCKSTARS! 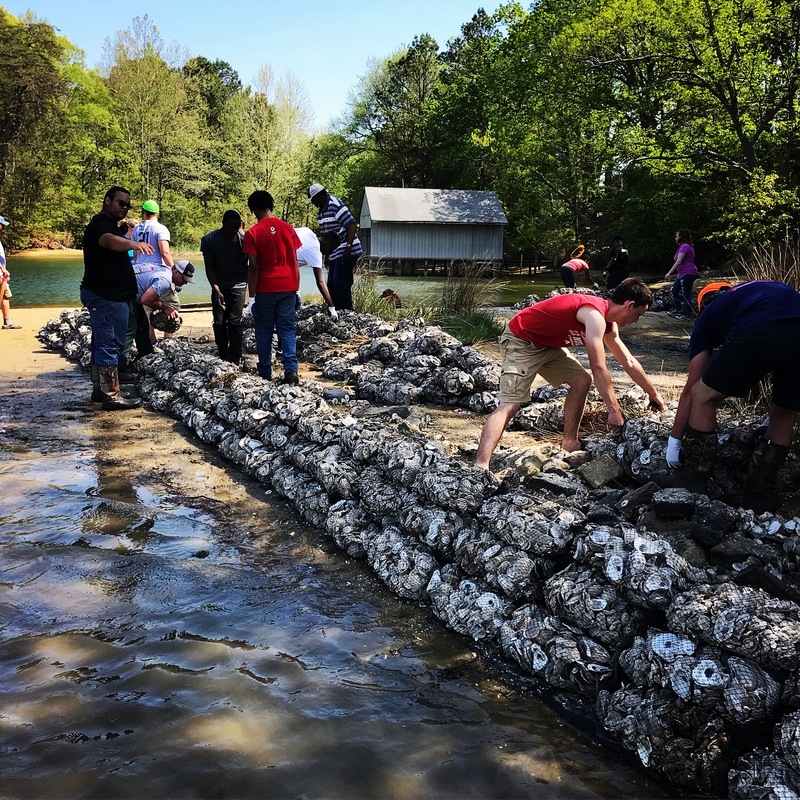 Under the leadership of Todd Davis and Tammy Cole, students formed a line from the bluff of the shoreline, down to its toe and efficiently handed one oyster bag after another until each was neatly placed into its reef position at the water’s edge. This project is one of several demonstration projects in the Northern Neck thanks to a small watershed grant from the National Fish and Wildlife Foundation’s Chesapeake Bay Stewardship Fund. The Northern Neck Planning District Commision (NNPDC) and Friends of the Rappahannock are looking forward to several more projects to protect the shorelines of the Northern Neck and reduce pollution entering the Rappahannock River.